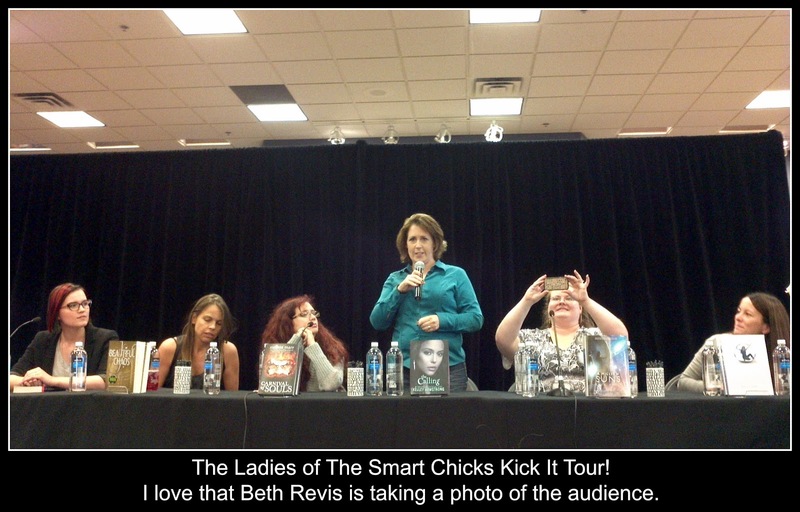 A Slice of Brie: The Smart Chicks Kick It Tour! Last Thursday night, I had the incredible opportunity to attend one of the best author appearances/signings of my life so far: The Smart Chicks Kick It Tour! Not only did I get to attend this event - I got to spend the evening with some of the awesome Edmonton Book Bloggers. The Smart Chicks Kick It Tour is an author tour that is organized by Kelley Armstrong and Melissa Marr. They started the tour back in 2010 and 2012 marked the third and final tour. 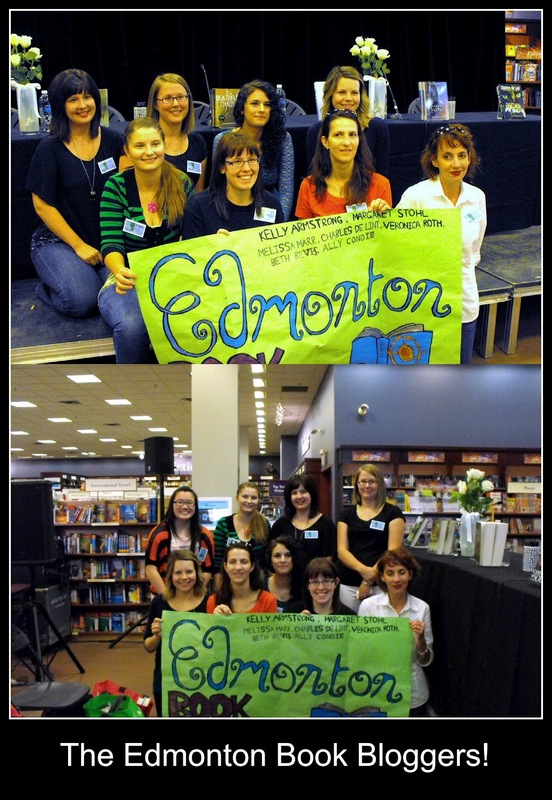 The event in Edmonton was held at the West side Chapters and it was reported that 750 people showed up for it! Luckily, a few of the Edmonton Book Bloggers were extra keen, and showed up early to reserve seats for our group (which was so awesome of them!). While the first 100 people got seats, the rest of the crowd stood in a line that wound throughout the entire bookstore. And thanks to those who showed up early, we got front row seats! The author's that are present change a bit from city to city. In Edmonton, we had the pleasure of meeting Kelley Armstrong, Melissa Marr, Veronica Roth, Ally Condie, Beth Revis, Margaret Stohl, and one 'chuck-for-good-luck', Charles De Lint. They came out as a panel and spent about an hour engaging the audience with Q&A's and trivia. 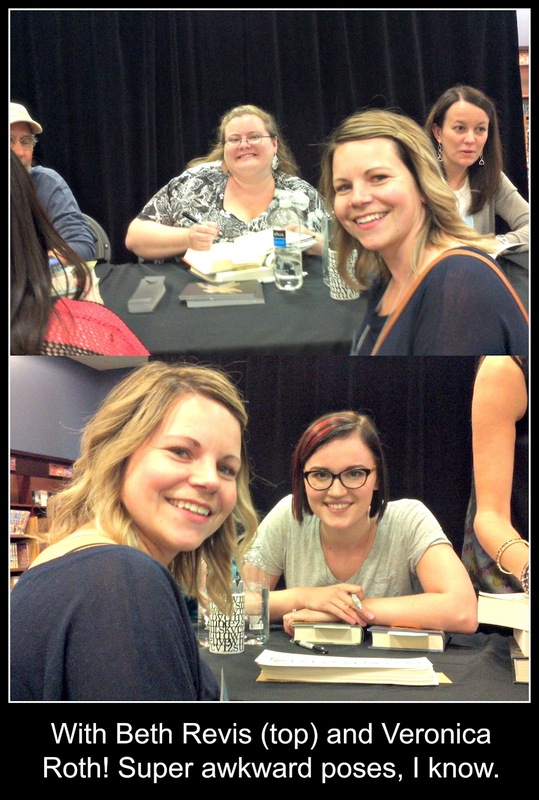 I have never laughed so hard at an author event and it was so neat to get to know the faces behind the books. I know most books have the author's mug shot on the back flap of their book, but it's still so different to see them in person and have their personalities come to life before your eyes. When it was time to get our books signed, I wished I had had a book of each author's to get signed. Sadly, I only had books by Veronica Roth and Beth Revis. I really cannot put into words how fun and amazing this event was. Meeting author's is for book-lovers what meeting a movie-star is for a fan. We were all a little star-struck! ;) I think it's fair to say this event was even more special because I got to share it with a great group of people who all share a love for books. 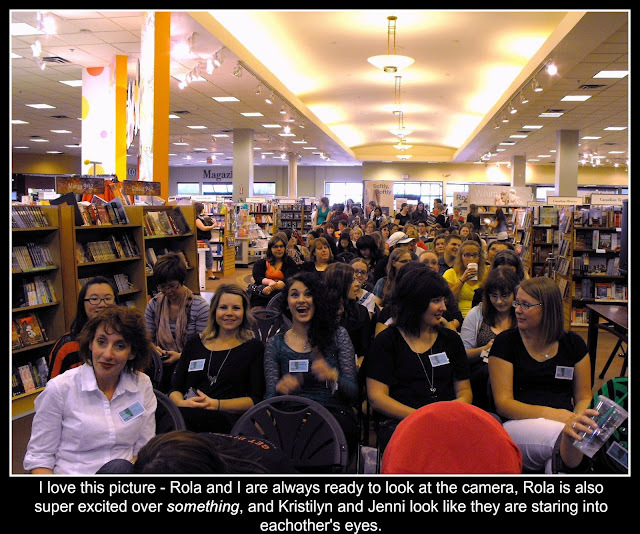 What's the best bookish event you've ever attended? Oooh Kristilyn and I were having a MOMENT! hahaha Love it! It was so much fun! and great that you didn't have ALL the books because then you could help us hoarders out. LOL Thanks again for taking my book up to Kelly. I can't wait until we can all get together again. Scrabble & Wine Brie, Scrabble & Wine! And YES - scrabble & wine SOON! Awesome post, Brie!!! And thank you. I had coffee in my mouth when I read your caption for that one picture -- I ALMOST spit it out on the computer! This was such a fun event and you're right -- it's like meeting a movie star! This is the first real bookish event I've attended. I did go to one signing at the public library, but it was small. Still, the author was super nice. I hope we have more awesome authors come to the city! Oh, and YES! Super awkward poses! I wish they each had separate tables or something so we could get pictures a little closer. Ah well. Bahahaha, that's funny! That picture still makes me laugh! Feels like so long ago already, even though it's only been a week. LOOOOL I got tired of smiling & *attempted* a new pose, but Tammy took the pic a littttleeeee fast ..... I'm still laughing at your caption ahahahah you girls are hilarious! This was my first book signing & it was definitly a successful one. I wonder when we'll get another chance like this one. Haha, it's hard to explain to people who "don't get it", how exciting it is to meet amazing authors! Heck, even when I'm not a huge fan of a particular author, it's exciting to meet them! It was so much fun, Melissa! At first I was almost dreading going because I hate sitting around and waiting for things to start, but we had fun just waiting even. It definitely helped that we had front row seats and weren't standing somewhere in the line where you couldn't even see anything! Yes! 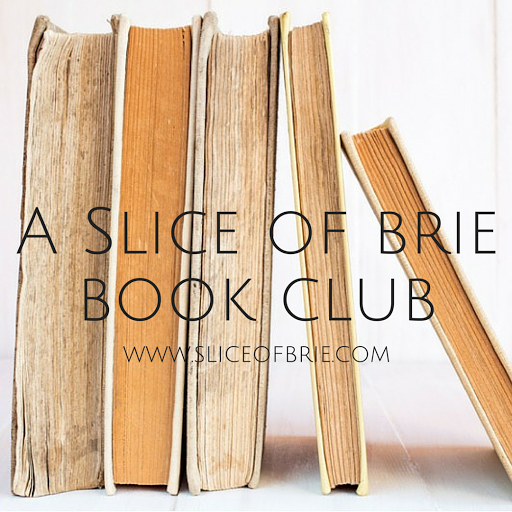 We will now be the Edmonton Book Blogger Groupies! Anywhere there is an author event, the EBB Groupies will be there! LOL. There were a lot of good photos, but I had no patience that night and just wanted to get the post up! But thank you :) I like to capture events like this so I can always look back on it. Hehe, I love that one candid photo of you guys in the middle. The excitement is palpable! This was my first ever author signing and I think I was explaining away why I was so nervous around the authors because of that, but I have a feeling I will always be a little starstruck at these things. You're right, I worship these guys! And I'm looking forward to more events to come!! Nova Scotia, We Have Arrived!